Weegee’s stash has been compromised? Pull some strings and make it a power-up! Edit: Through a few comments, I’ve gathered that some are interpreting the last panel in a more “dark” fashion. 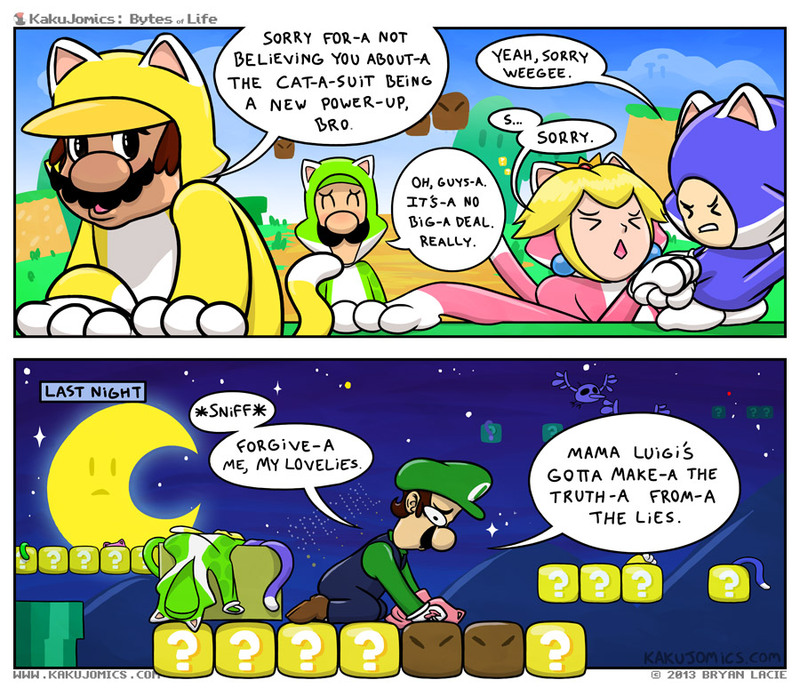 Don’t worry, it’s just Luigi’s lavish collection of cat-suits, synthetic fiber and all that. This Friday (07/12) 9pm CST, there will be another KakuCraft stream! Wanna join in and all that? Read the guide. Gaming Channel stuff! I started playing Cube World, Hamus and I played Little Inferno, and the KakuCraft Minecraft Mindcrack server’s inaugural stream went up on the channel. Okay, that’s enough Weegee, for now. Maybe another Animal Crossing comic, next week. The moral of the story: Every dream has its price. But wouldn’t they just find out it has no extra powers?